Background: The Cause Behind a False "Dawn of Justice"
One that made the news briefly … a truck or van driver Abdulmuemen Alhaj Hamdo, from Idlib or perhaps Latakia, was said to be abducted, went missing, was detained from a government checkpoint, something... in February, 2013. The part that seems clear is he wound up dead, seen in one of the "Caesar photos" a year or two later. "Stephen Rapp, former U.S. ambassador at large for war crimes issues... "It is the dawn of justice for Syria, it will only get stronger after this point," he said." "A panel of top judges in Spain says the country’s courts have no jurisdiction to investigate the first foreign criminal case for torture and terrorism against the Syrian government. The U-turn by Spain’s National Court is a setback for activists and human rights campaigners who had hailed the case as a stepping stone for accountability in Syria." So it didn't really go anywhere. They can keep moaning about denied justice. A few further articles about the case give more details about the victim in question. The Guernica 37 lawyers argue that Hamdo’s sister should be considered an indirect victim — which satisfies Spanish law’s requirement that a victim in a criminal case should have Spanish nationality at the moment when the alleged crime was committed. Hamdo was detained somewhere between his hometown of Mashta al-Helou in Latakia and Homs city, a route he regularly took from his job as a delivery van driver. "From Caesar’s photo, the family was able to deduce that Hamdo was tortured and executed in Branch 248." Most sources cite a 2015 ID by the man's eldest son, but his sister says her niece (his daughter?) already made the match from an online photo in 2014. (That also involved "government checkpoint," where others say it more like "missing") Neither the 2014 nor 2015 identification claim seems to give a month (one report said "mid-2015"). "The sister learned of her brother's death by looking at the macabre trove of photographs" herself, AP reported. But that could be a fuzzed report of either of these other stories, besides, perhaps, a third story. It doesn't seem likely both storiesare true. Wouldn't everyone hear about whichever match came first, so the second one would never happen? The 2014 match is unlikely, and I can see why they might change that story, or call it an erred memory. Barely any of the photos were published in 2014. I'm Not sure about Arabic sources, esp. Zaman Al-Wasl, etc. at the moment, but Western-published images had faces blurred out almost 100% of the time It's possible these few contained one of the 54 victims included for the small Branch 248 folder, and showed a face to match, but that might be provably impossibly (with more work than I'm willing to do). The other story is much better; it was only in March, 2015, that the full set of face-shots people have mainly used for IDs were made available on the SAFMCD website (and briefly by a Facebook site as well). The facial details there are all but required for a good visual match. Mr. Hamdo has no published images (I know of) to compare with the "Caesar photos" I have on file. That would yield a photo folder date (indirect clue to death date), and some visual clues on how he died (usually just those from the neck up). But if I had one, and he was in 248 … that's likely to be a quick match, except for how people change under starvation, neglect, sometimes torture, and usually it seems poisonous gas extermination at the end. The basics, in review, will help find more details on this alleged victim of Assad regime brutality. - Abdulmuemen Alhaj Hamdo - Name always given just like that. Age never given, even approximately. - disappearance perhaps on Feb. 17 2013, driving between Homs and "Mashta el Helou"
- No mention of any further news from him, trials, sightings, anything. The name Abdulmomen ( عبد المؤمن) does not appear. * Abdulmou'men Hamdow from Karnaz, Hama. A non-civilian, he died 2013-02-03 "due to clashes with regime's army." Also noted: "defected colonel." so really, might be from either side (some allegedly tried to defect right at the end, but not quick enough...) noted nickname Abu Omar suggests he was on the Islamist side). Kernaz is not in Idlib, but it's right on the border, just west of Kafr Zita, Hama, southwest of Khan Sheikhoun, Idlib. No mention of driving, and locale of clashes not clear, but this is just about the name given, and the date is only two weeks too early to match. But it says he was killed in shooting, not detained. Former military, defected to be a fighter, not the civilian presented. In the VDC's detainees database, one can find Major (SAA?) Abdulmoamen Muhammad Hamdou, from unknown (possibly Idlib), "in a list of military detainees in Seidnayah prison," no mention of his having defected, or of being a driver delivering goods... Detention Date (inaccurate) 2013-05-19. That's likely a reported-on date, so based on an alleged sighting, etc. from then or earlier. Considering the above … two military guys with the same basic name, one said shot by the regime, one said arrested by the regime … is this two references to the same man? Killed, no taken alive but likely to die... same man later dead in the Caesar photos? 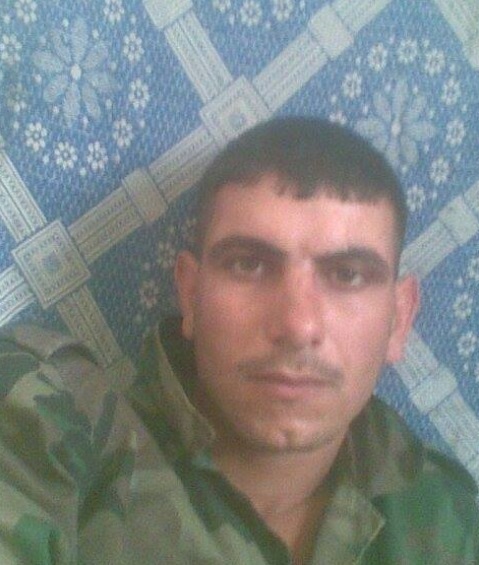 Abdul Mote Hamdo al-Qasem, from Halfaya, Hama, a civilian, killed (by?) 2013-08-26 (inaccurate) in Damascus, after being "detained on August 2011 with his brother Emad" - not quite the right name, locale, or story. martyr Mohammad Haj Hamdo, civilian, from Aleppo, 2014-05-24 "Martyred under torture in the regime`s prisons in the State Security Branch Date of death unknown accurately, Corpse are in Aleppo university hospital" Should not be in the Caesar photos, by time or locale, incomplete name match, etc. Notes: "under torture in the regime`s prisons, Date of death unknown accurately. The Hamdo Family was informed about the death of their son by the Personal Status Department in Mharda"
I checked the regime forces/otherstatistics list (all names including Hamdo), didn't see any likely matches (one likely relative was killed fighting terrorists in 2012). I don't always check their smaller "missing" database, but did and found another 'defected' military Hamdo near-match, and also … what the hell is going on here? Photo provided, in uniform. Unhappy non-selfie from prior to capture? Hostage photo made available to someone? Qaryatain is nowhere near where our subject was said to go missing - it's way south of Homs, in the desert halfway to Damascus. This is also about one month later than the reported arrest of a guy with such a similar name. But … that could still be two versions of one man's story, with one or probably both being mostly untrue, in a few clashing effort to conceal the true story. That seems to happen. Likely, this missing soldier is a different relative of the missing driver. And both went missing around Homs, about one month apart. This one, got in contact with opposition people enough they knew he had "broken away" - I mean, you don't just make that up. Maybe he was an active fighter who had defected month ago. But then must have been back out of touch, as they don't know where the hell he went. Just wandered off. Hm. This is Abdulfatah, not Abdulmomen, but it seems he has the same father's name - Haj Hamdo - as the missing-detained guy in question. If these aren't the same guy reported differently, or two brothers … it would be quite a coincidence if two different sons of two different Hajj Hamdos would both go missing-detained in rural Homs within a span of about one month. It's not a very common name, either part and especially in that combination. And Two More Haj Hamdos Just Vanished Then? These two lack explanation, like how they went missing, but likely they were with Abdelfatah for some reason as he 'defected.' Coordinated abductions in different areas can also be coordinated. A dead Facebook link is provided. So … the driver with the sister in Spain was oddly not listed by the VDC, unless he was - also oddly - as an unmentioned militant, probably for the government side at one point if not always. But they have relatives listed - is it four total, for five including the one they missed? Or is one of these the same man that Spanish court was so interested in? And that other Hamdo soldier taken into regime prison apparently prior to May, 2013... is he part of this strange pattern? Targeting a group of gunmen in the village of Mughayira in Hama countryside, killing and wounding a number of them # known as "Abdul Momen Hamdo"
Mentions he was from Kernaz. No other tweets I could locate seemed to mention anyone with a more similar name. So he never received much social media support, unless he's that militant, who would have two different stories now. My guess is his case was never strong or clear, like the few cases meant to highlight (like known peaceful activists Rihab Allawi and Ayham Ghazoul, etc.). He was just one of the many murkier cases who happened to have foreign nationality - or rather his sister did, at the reported time of the arrest-disappearance, and had a case develop far enough to make the news. We hear Abdulmuemen was a truck driver , or van (perhaps minibus?) driver - Two sources cite Homs and "Mashta el Helou" as the places he was between when he went missing. One source said this was in Latakia (and was his hometown), while the other doesn't say. It could be Mr. Hamdo was killed by terrorists who wanted his truck/van, or were already using it. Professional drivers of taxis, trucks, etc. and people abducted while driving are common in the Caesar photos. Several captured drivers wind up with brothers and cousins also tortured-detained to death ... perhaps after they showed up at the jail with some ransom money? How many relatives of this Abdelmuemen Hamdo were killed, detained, or went missing at the same basic time? The VDC lists at least 4, none of them clearly this guy (so maybe 5+ - another defected military Hamdo arrested prior to May, 2013...). Regardless of those questions, the best evidence already suggests the famous "Caesar torture photos" show several thousand Syrian men and boys systematically exterminated by terrorists, likely with Jaish Al-Islam, who had the run of the countryside around Damascus. Many of them look like soldiers and militiamen, and some at least are Shi'ite, Alawites, or Christians (just those that can be told by visible tattoos). Beyond the "Caesar photos," other abducted drivers, especially of large and expensive and useful vehicles, including firetrucks and armored fighting vehicles, often wind up dead, vehicles unknown, regime blamed as possible. One was a bus driver, killed along with a small family, found dumped just north of the Al-Houla area, just before the infamous massacre there on 25 May, 2012. It turns out that was conducted by a huge rebel force, including foreigners - just after a couple busses with Shi'ite pilgrims were hijacked near the Turkish border on 22 May. Did the jihadists involved cross the border and use those busses to travel south to Houla before they massacre over 100 people from loyalist Sunni and Shia convert families? There have been many clear cases of buses, minibuses and vans carrying state workers or other travelers, hijacked by armed gangs who single out and executing non-Sunni passengers. This was especially common in the Homs area in 2012 and 2013. I haven't studied other areas as much. See several bus massacres listed here, even though that wasn't the main scope (so I've missed many). Side-note: His sister's name - Amal Hag (Haj) Hamdo Anfalis - is a bit odd. They both share the middle name Haj, presumably their father's first name. But the family part is half-different from his. Observant Muslim women usually keep only their father's name on marriage, shunning the adoption of her husband's name, so she would stay a Hamdo. Here, it sounds like she took both names, after marrying a man named Anfalis. Anfal is an Arabic word, but Anfalis sounded Greek, and Greek names are common among Syrian and Lebanese Christians. But a bit of searching suggests it is an Arabic name. (which are also used by Christians and others in that language area … it's just a neutral clue). Still, her adoption of it suggests at least the family is not part of a Sunni extremist network, who have a way sometimes of getting arrested by the authorities. And, perhaps, she has the extra name for some other reason. That's too big a paragraph for such a small clue, but oh well. It's at the end now. Unless this isn't the end. They seem possible. Here's space.